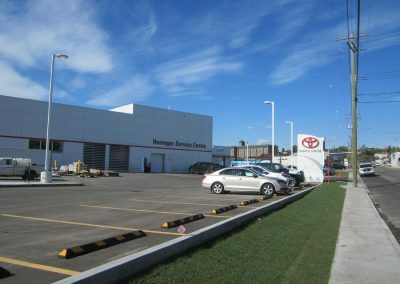 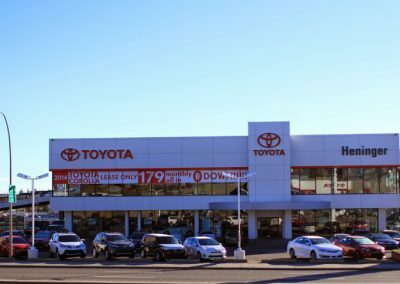 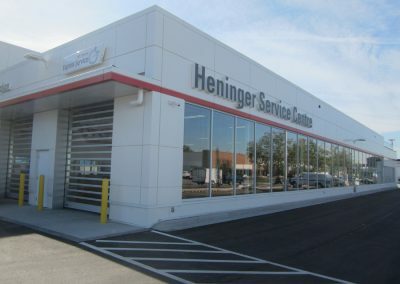 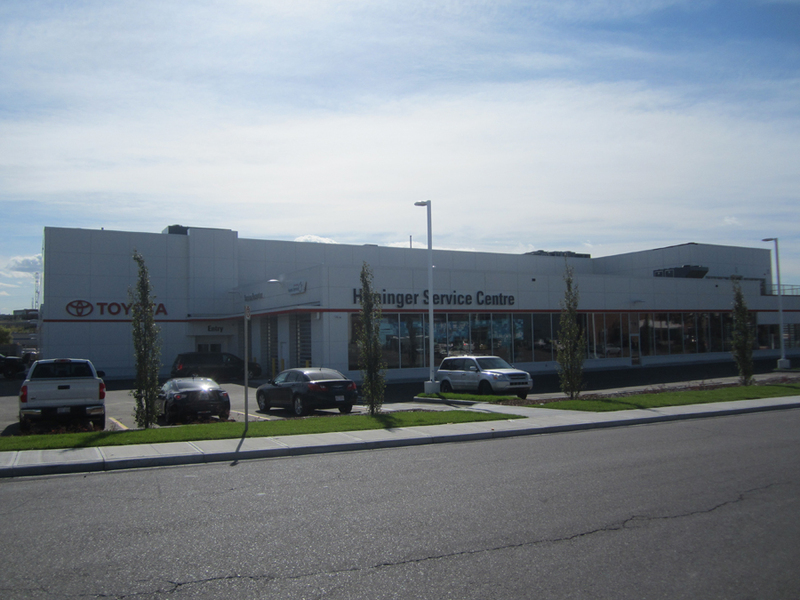 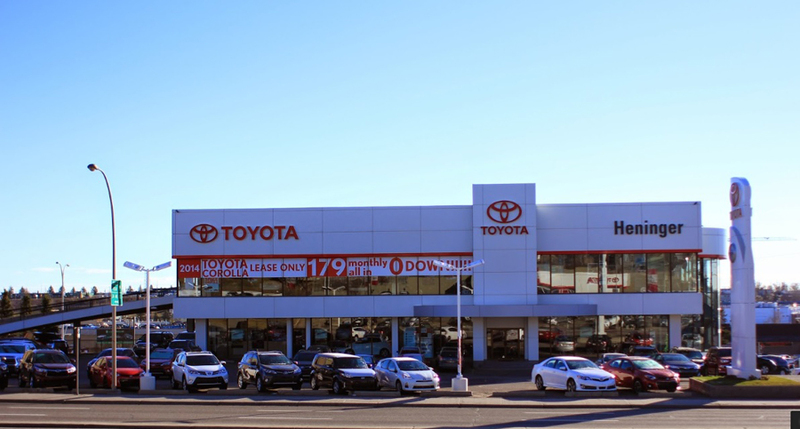 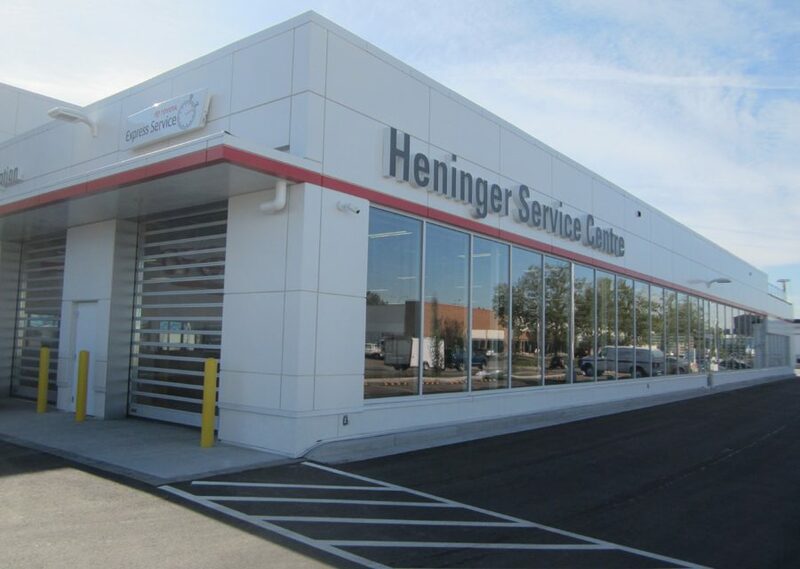 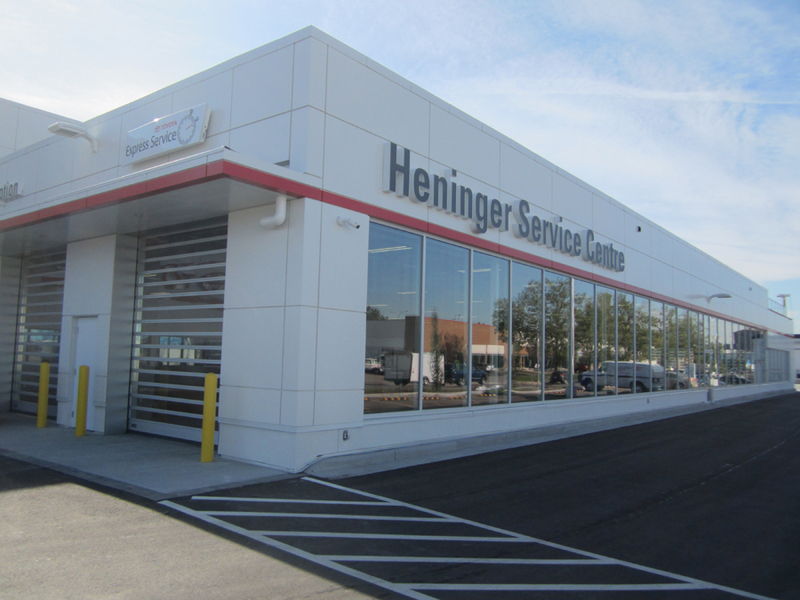 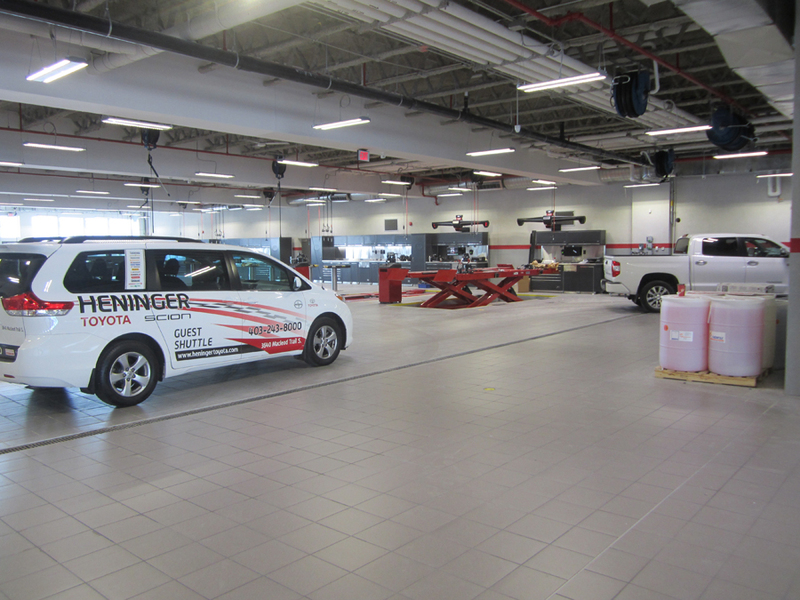 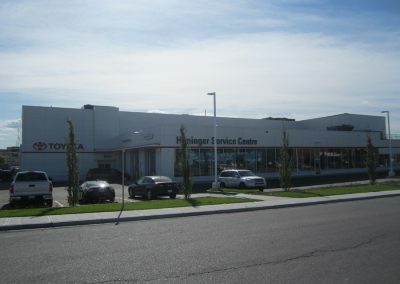 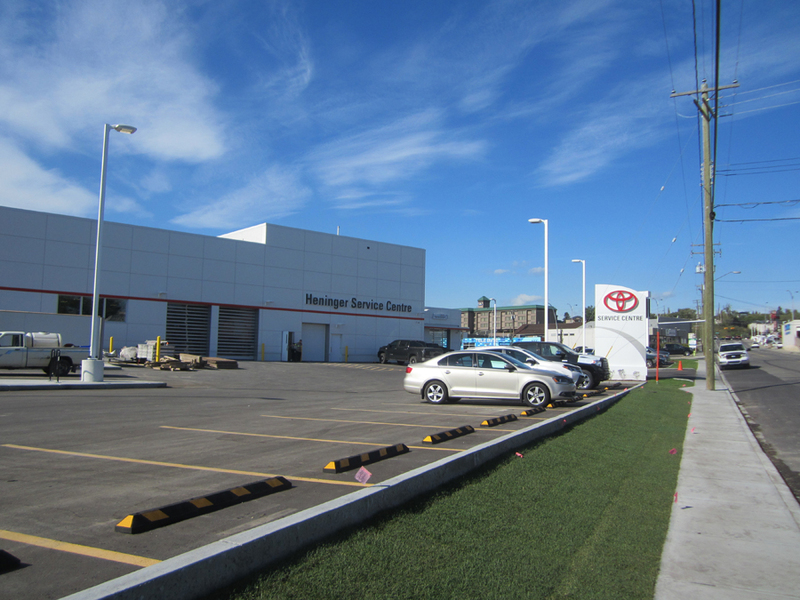 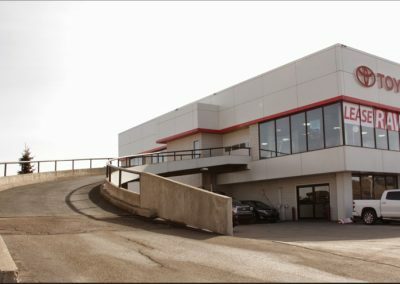 Heninger Toyota is a state-of-the-art automobile dealership built in the heart of Calgary, Alberta, Canada. 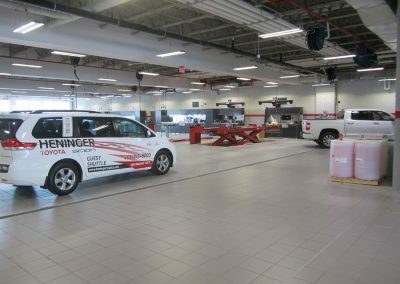 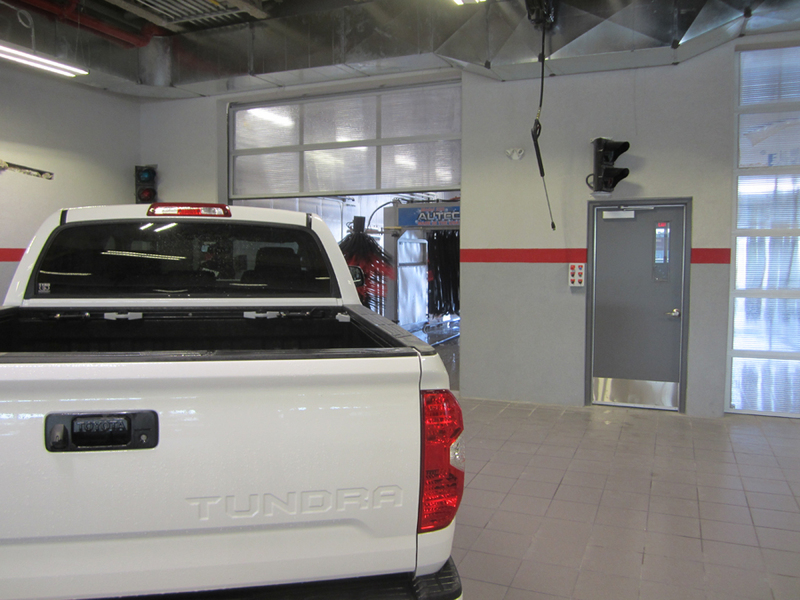 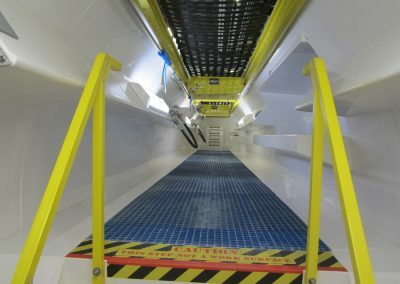 Opened to the public last fall, the service department features a drive-in sensor track, which X-rays the incoming vehicles, automatically performs diagnostic tests and then generates a summary of that information on the computer monitor of the technician. 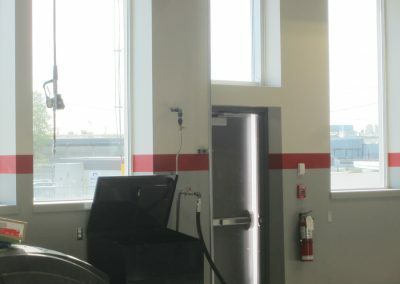 The cutting-edge technology in this dealership extends beyond the mechanic bays, though. 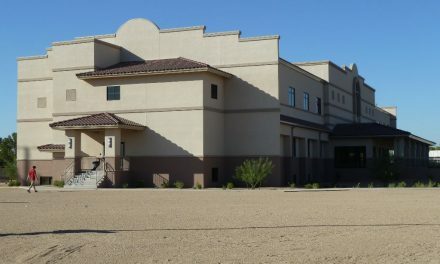 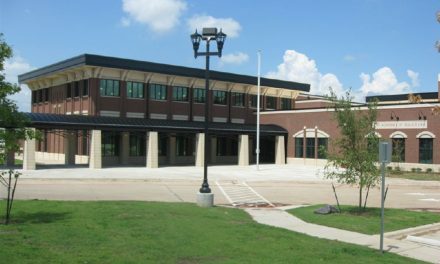 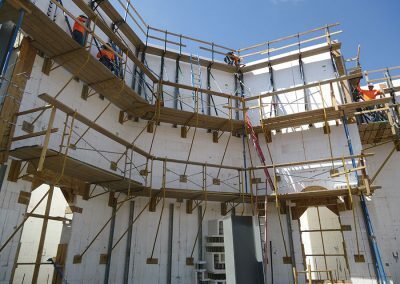 The shell of the building was built with an innovative foam and concrete construction method that provides unrivaled strength and energy efficiency. 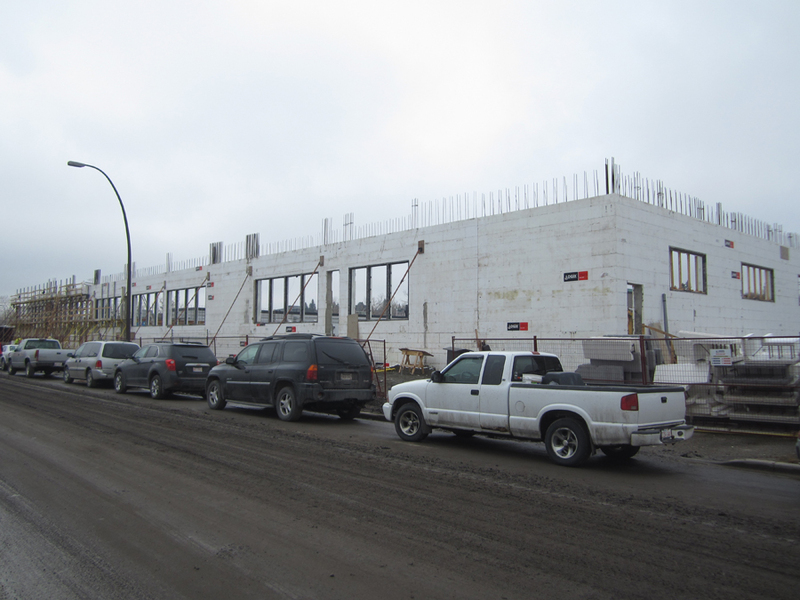 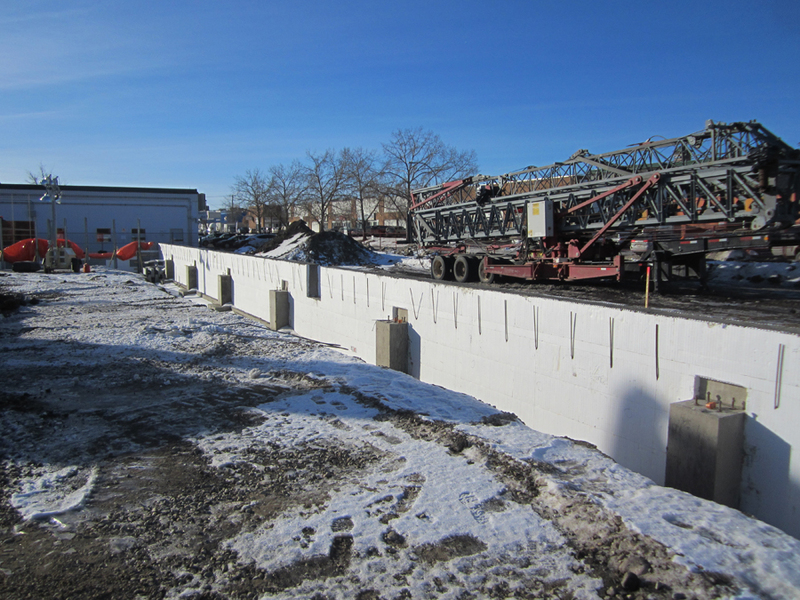 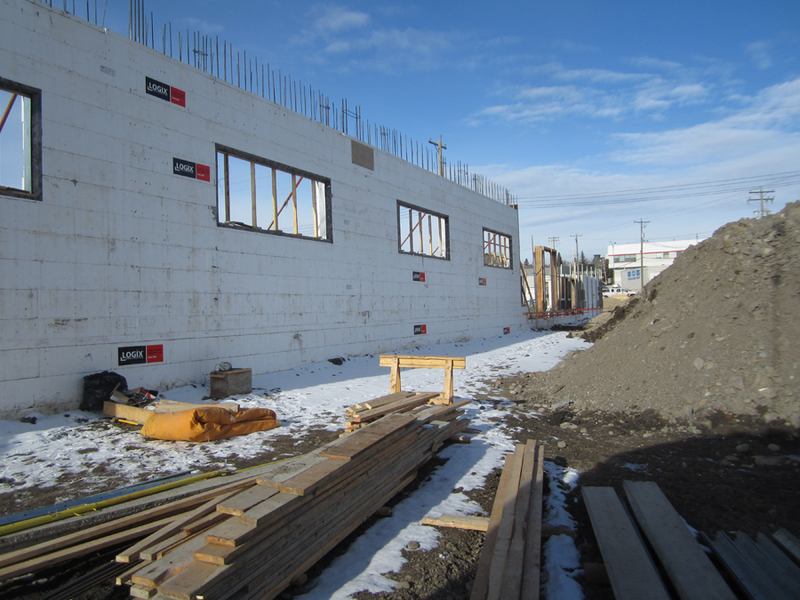 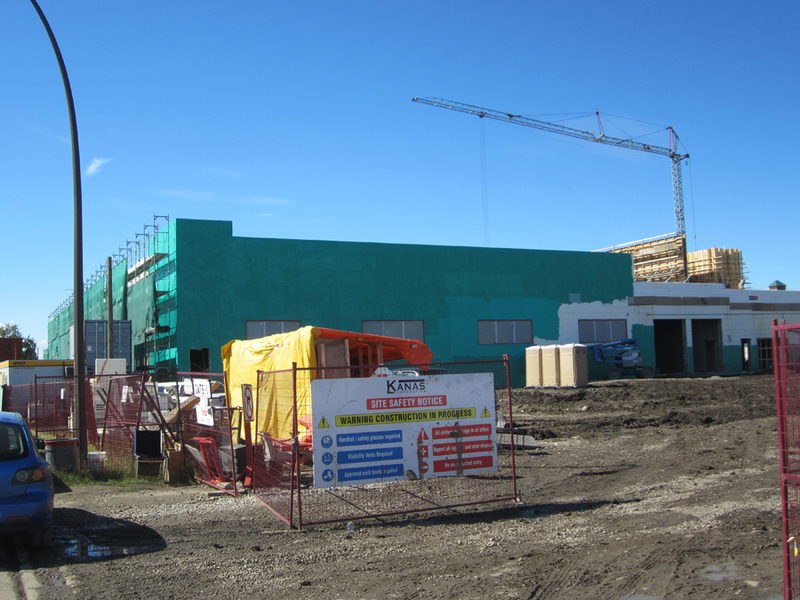 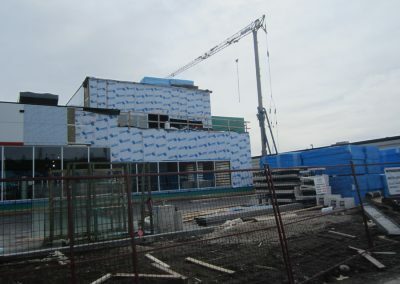 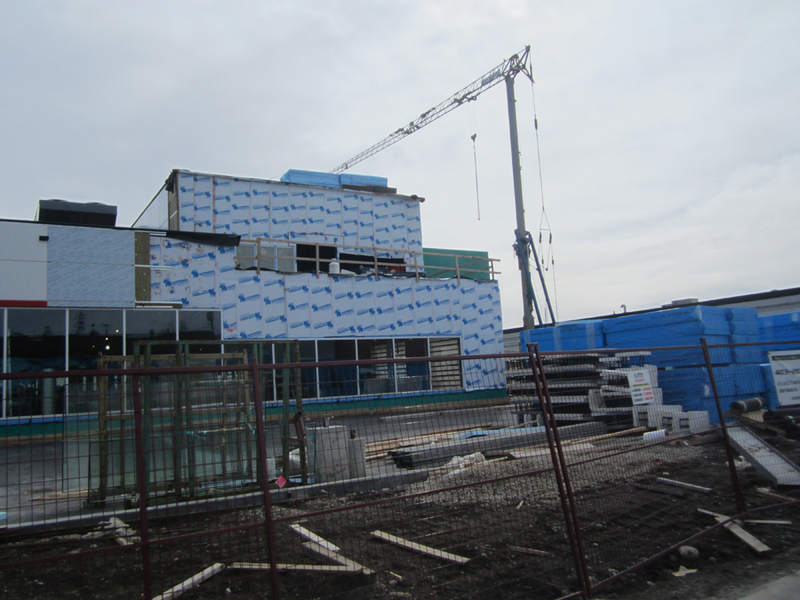 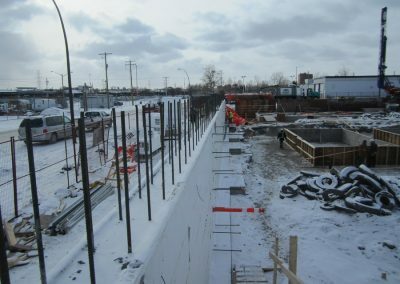 Despite frigid weather, ICF work experienced no delays. 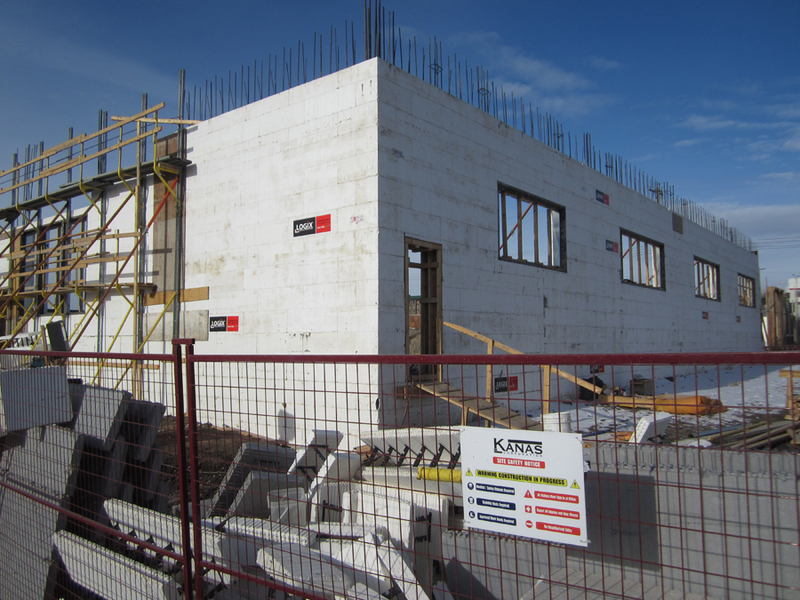 One of the dealership owners had built his own home with Insulated Concrete Forms (ICFs). 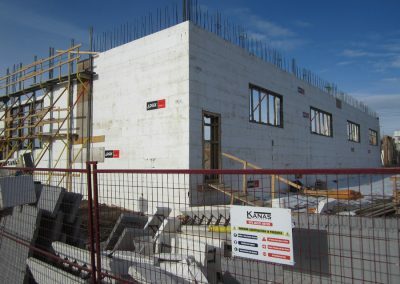 This building method uses hollow blocks of rigid polystyrene foam to form the walls, which are then filled with steel-reinforced concrete. 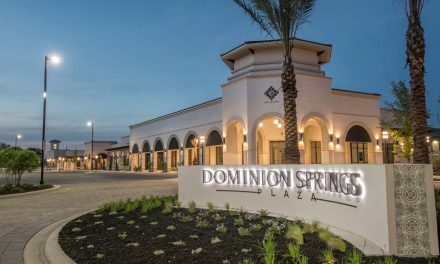 He was so impressed with the home’s performance and the builder’s skill that he convinced the other shareholders to build the dealership with ICFs as well. 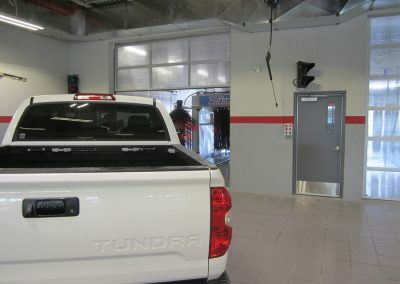 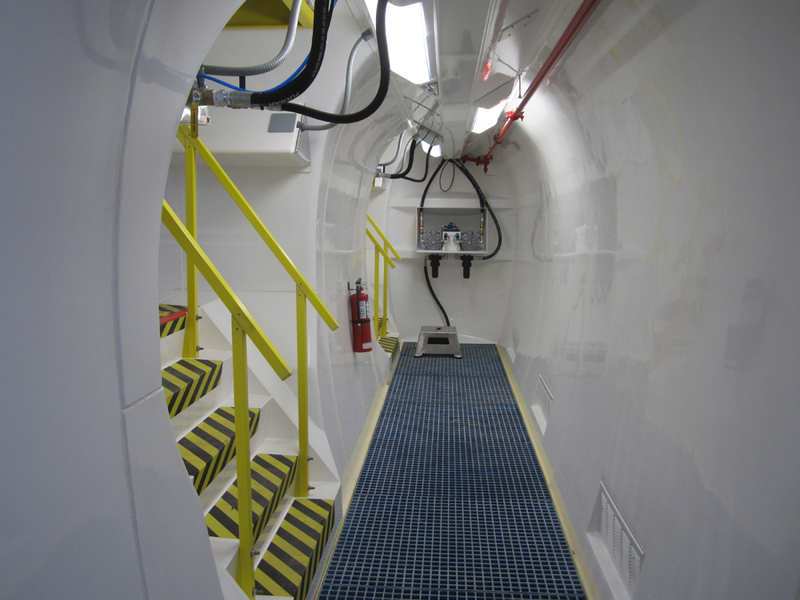 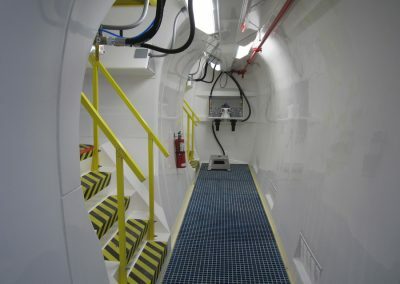 The facility uses green technology at every opportunity. 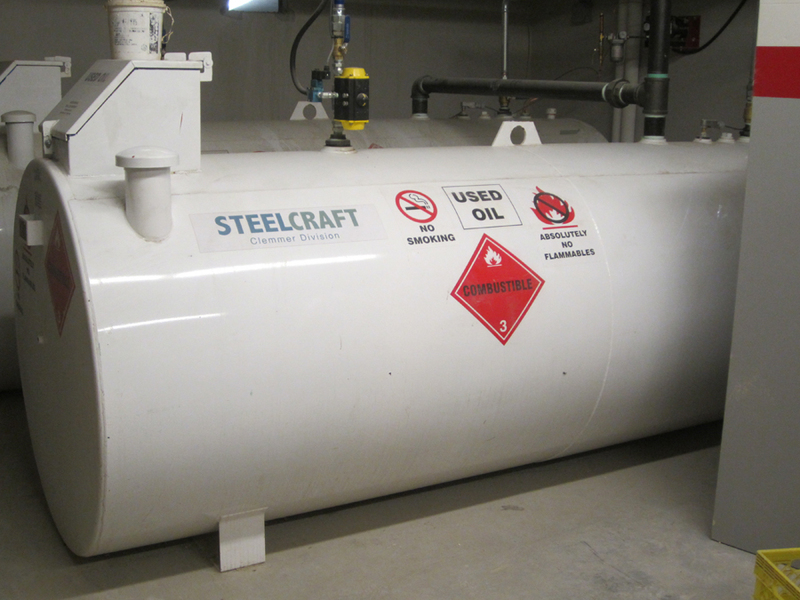 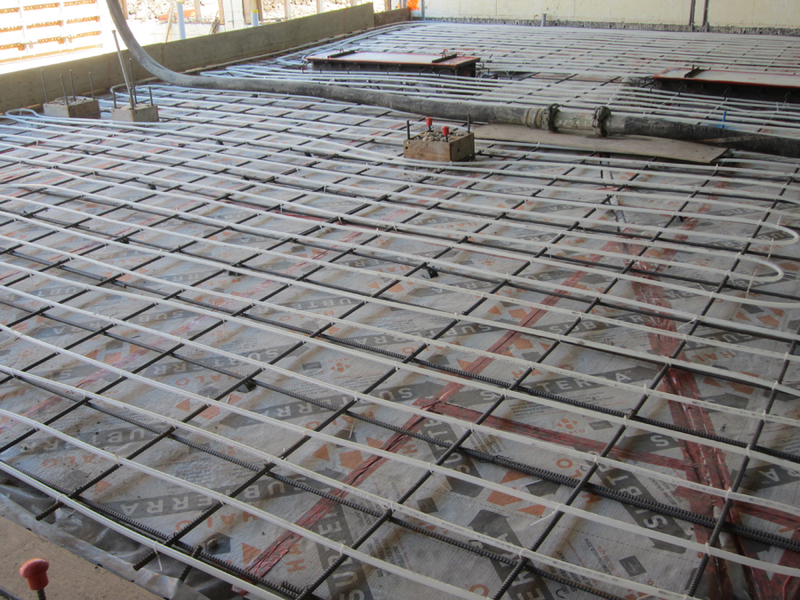 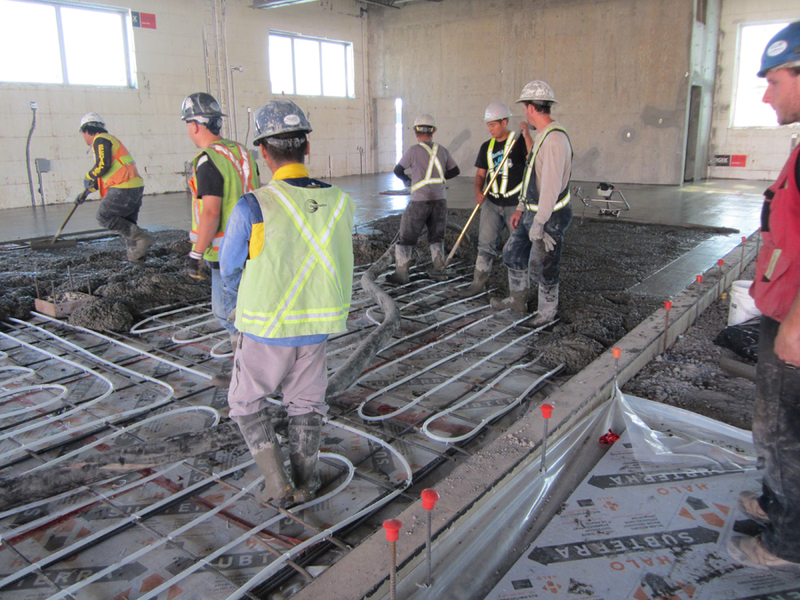 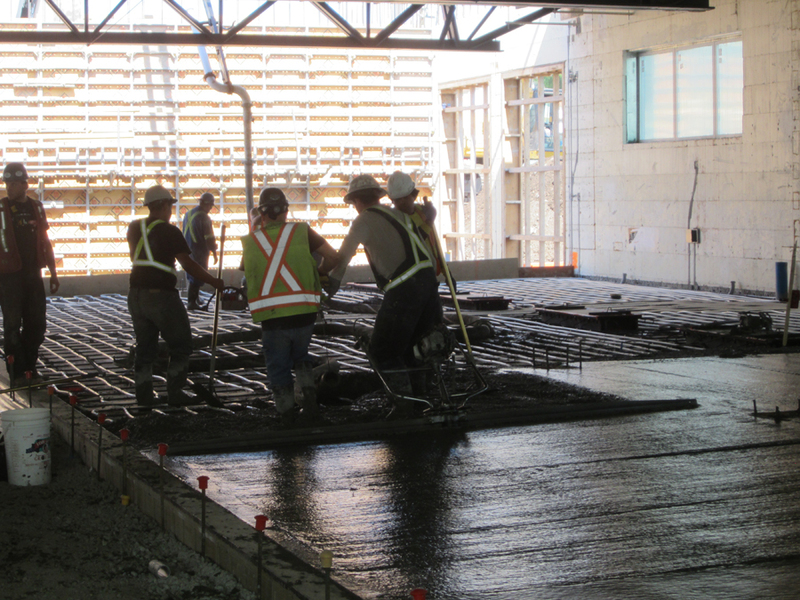 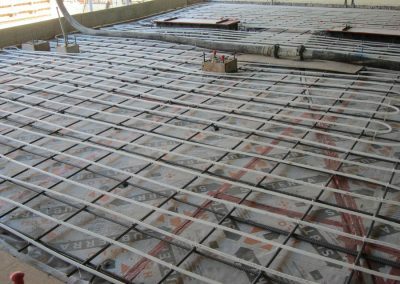 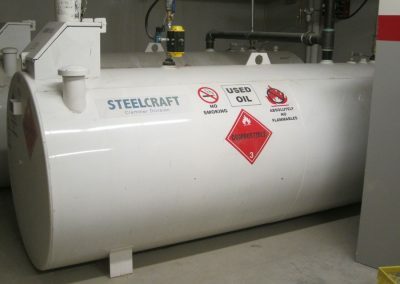 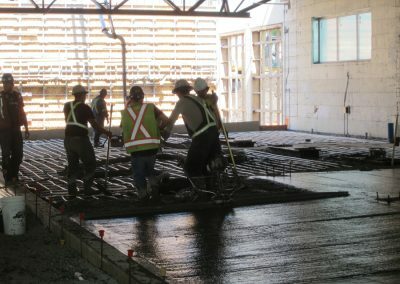 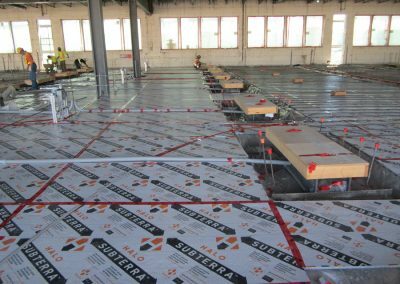 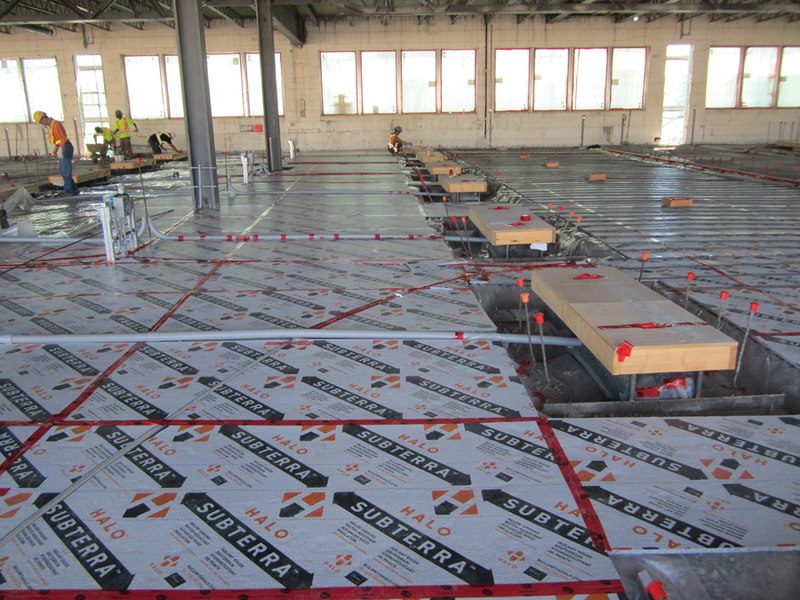 Radiant floor heating sits atop R-10 underslab insulation and is powered by a high-efficiency furnace fueled by waste motor oil. 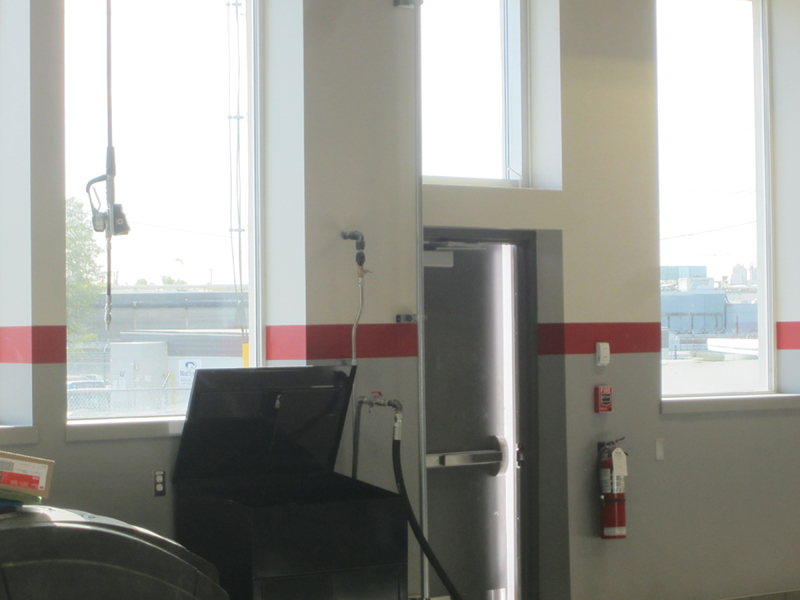 LED lighting throughout the building is tied to dimmer switches that automatically adjust based on the amount of daylight. According to Dan Reefke, who supplied the Logix ICF for the project, the biggest challenge was getting the project out of the ground. 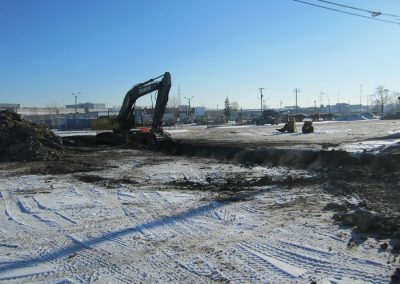 Construction was delayed when soil contamination—from the previous owner, a gas station—was discovered, and delayed again to move a set of power lines overhead. 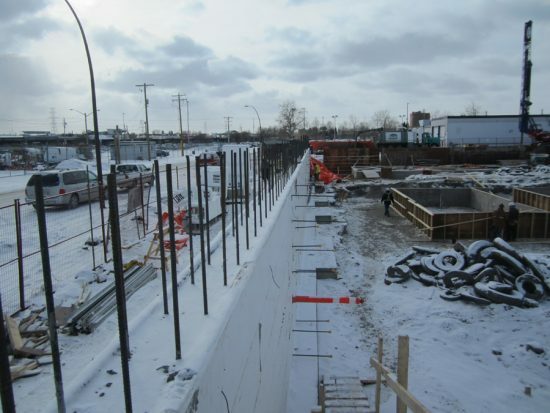 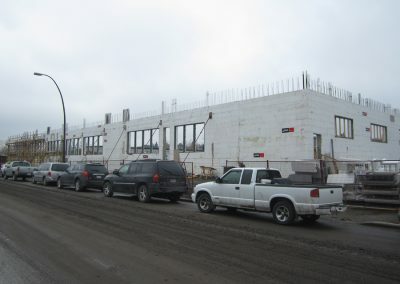 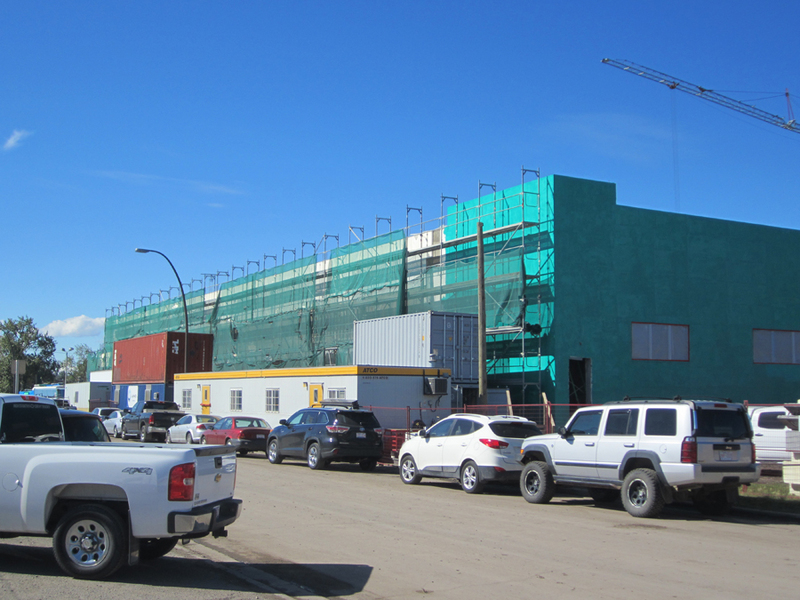 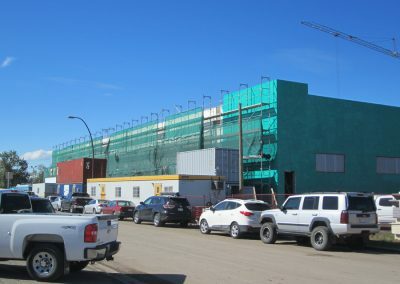 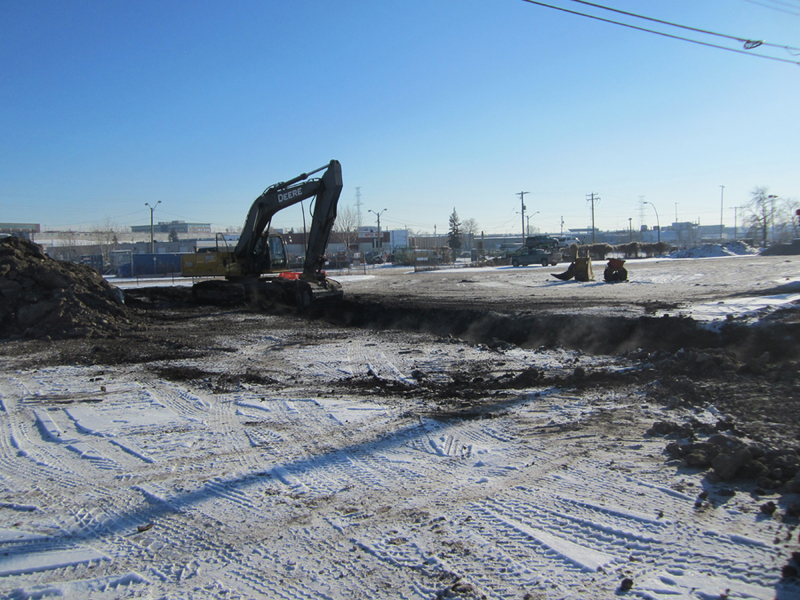 The initial construction delays forced the ICF portion of the schedule into the Canadian winter, but the crews from Kanas Corp. kept stacking. 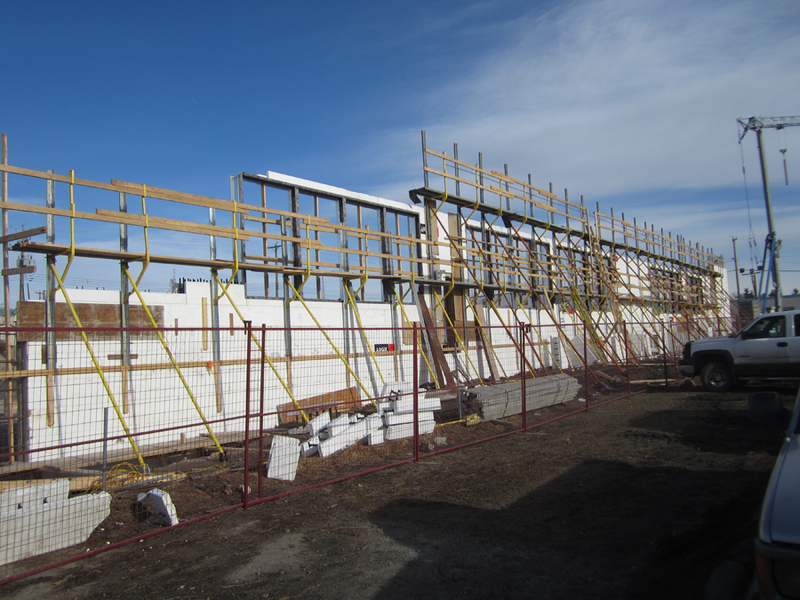 The long lintels above windows required special attention to keep the walls straight and true, especially as they rose above 15 feet. 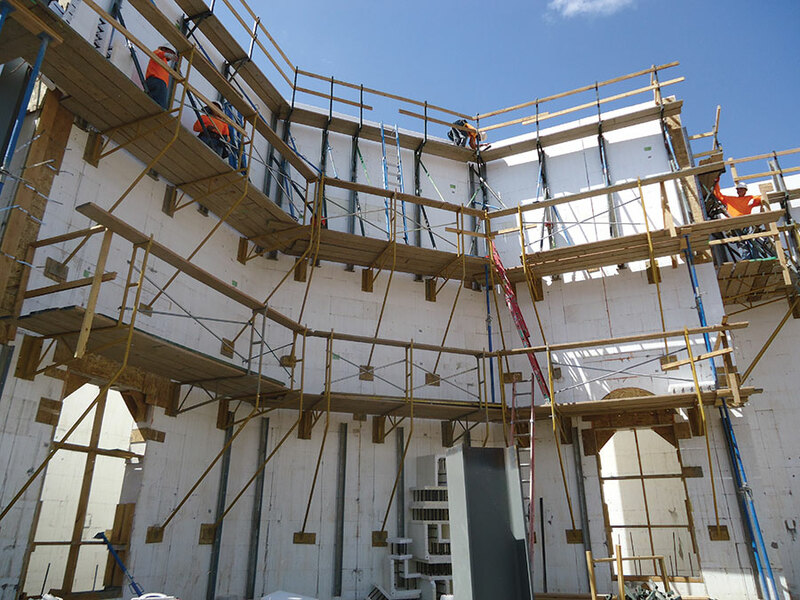 The tallest walls reach 40′ above the footers, with several sections in the showroom stretching 20′ high without intermediate supports. 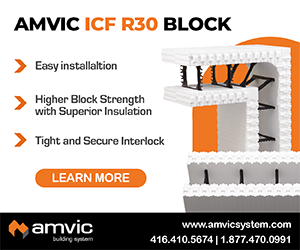 The building is designed strongly enough that a third ICF level can be constructed in the future. 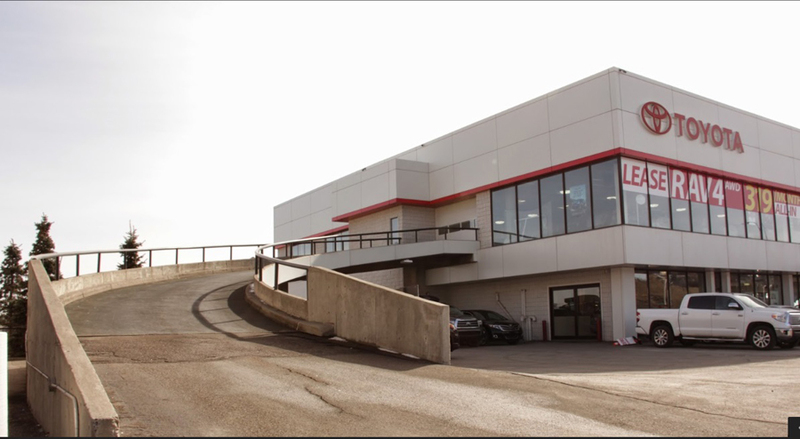 In the meantime, the flat roof is used as storage for excess vehicle inventory. 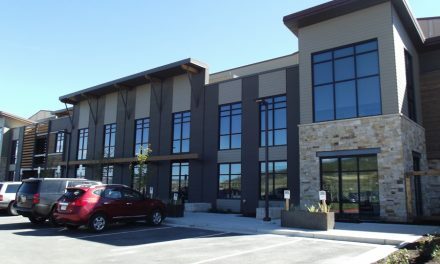 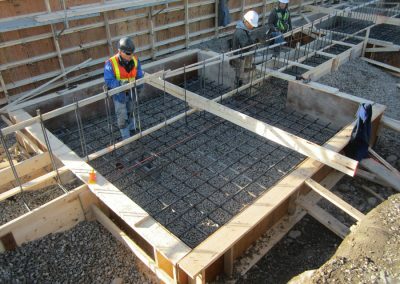 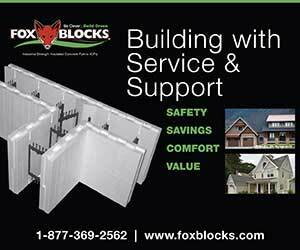 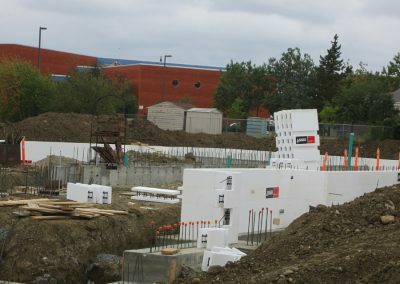 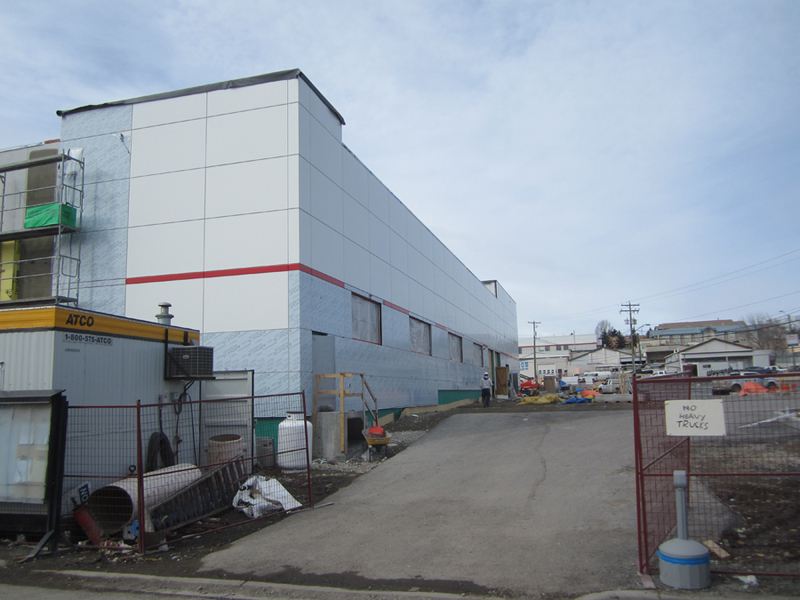 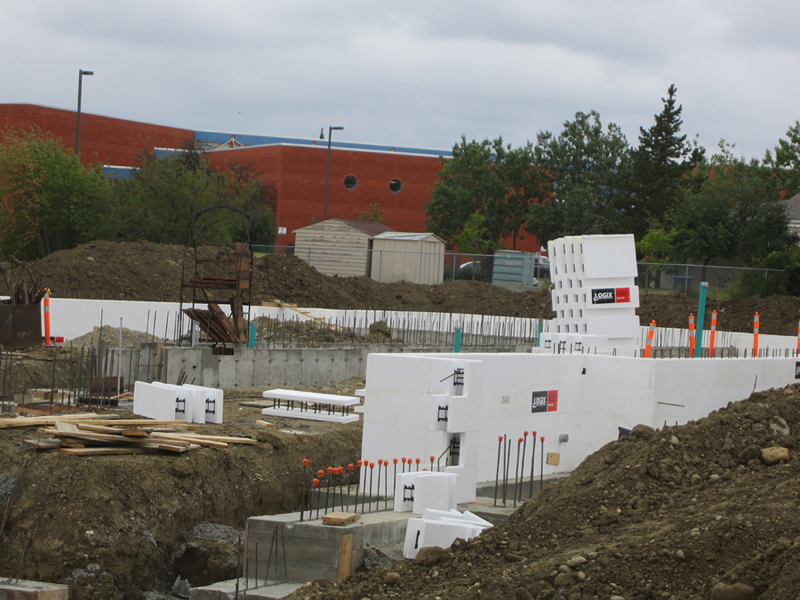 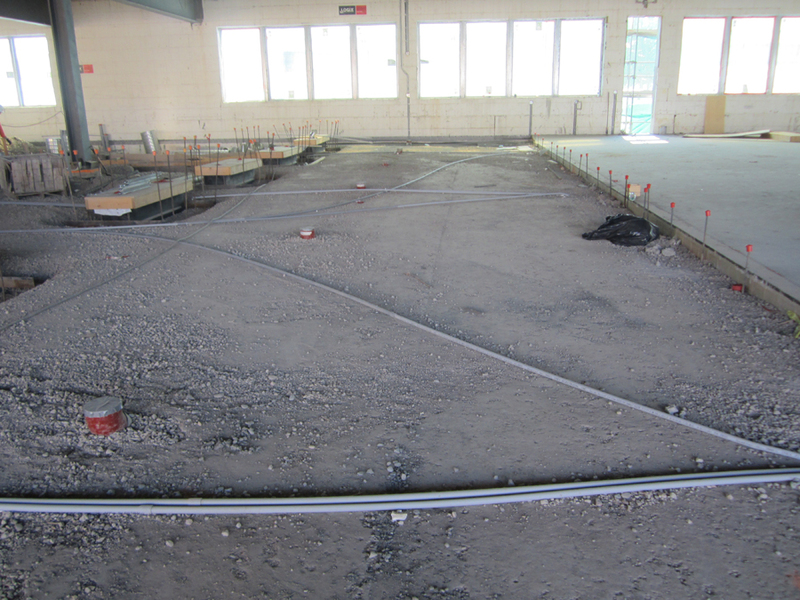 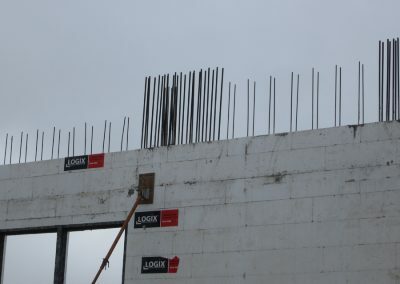 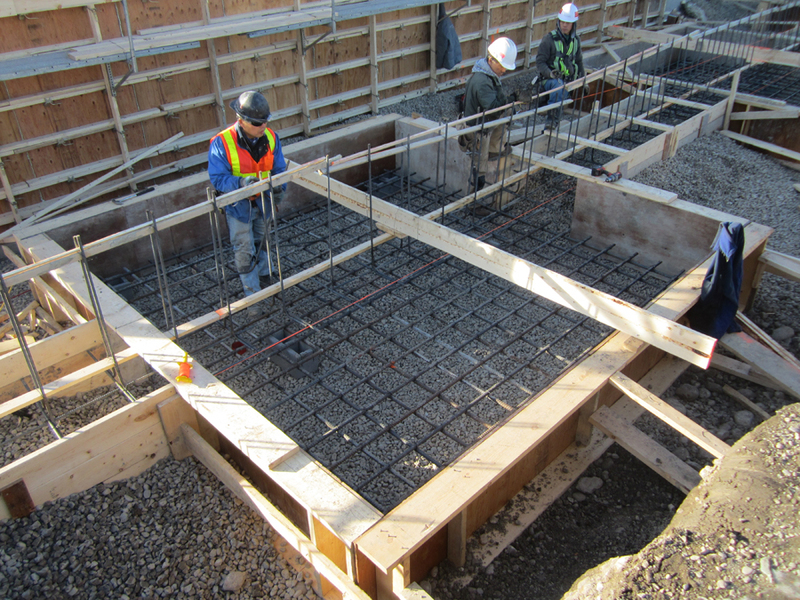 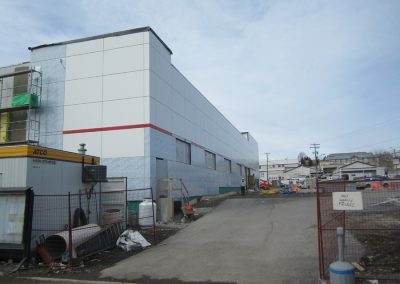 Because of the loads, the building used ICFs with a 10″ concrete core. 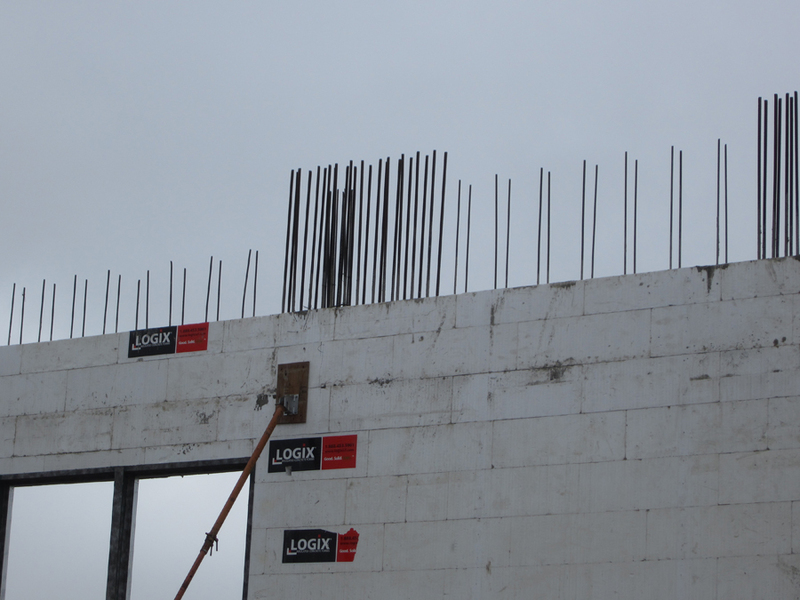 Additionally, pilasters were built into the wall; each has 24 pieces of #8 (one-inch-diameter) vertical rebar. 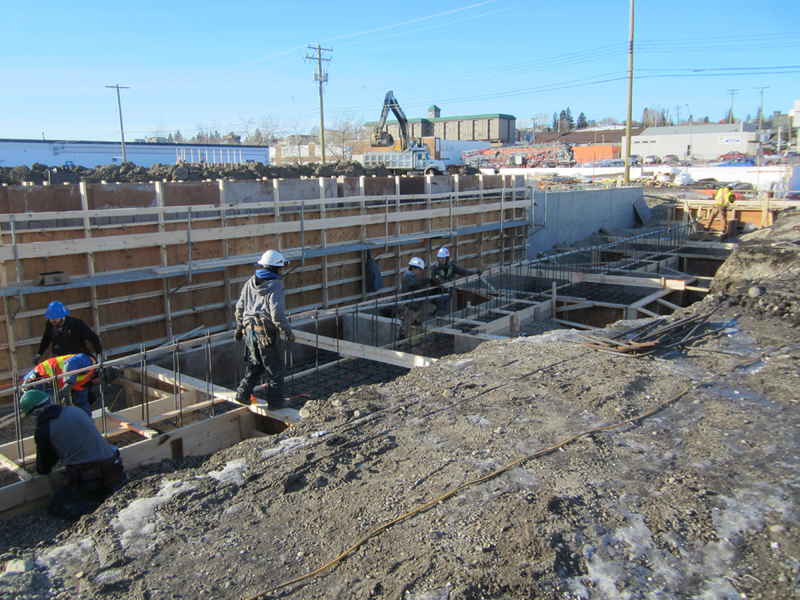 Walls were poured in 10-foot lifts. 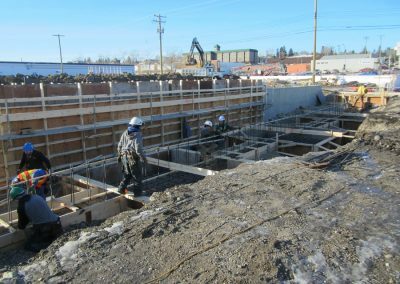 The contractor used a special high-slump ICF mix design to ensure good consolidation around the congested reinforcing steel. 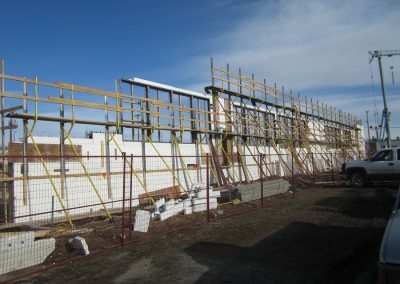 ICF Use: 19,000 sq. 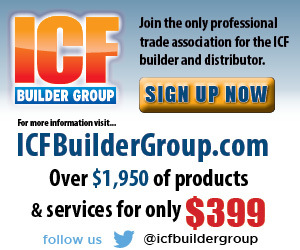 ft.
General Contractor + ICF Installer: Kanas Corp.